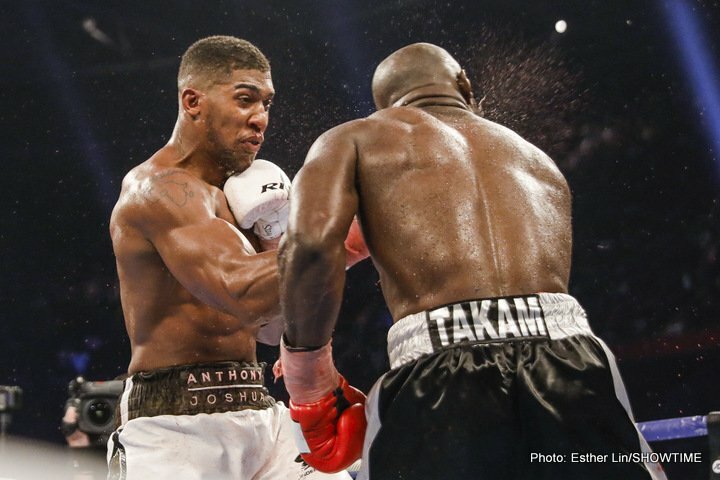 By Juan Flores: Deontay Wilder saw a lot of flaws in IBF/WBA heavyweight champion Anthony Joshua’s performance in stopping Carlos Takam (35-4-1, 27 KOs) in the 10th round last Saturday night. Like a lot of people, Wilder spotted Joshua’s stamina problems that surfaced in the second half of the fight. Wilder says Joshua was too muscular for the fight, but the referee was giving him a lot of rest breaks by stopping the action. Wilder thought the referee stopped the fight WAY too early in round 10 when Takam was still on his feet. Deontay remarks that the referee appeared to be trying to stop the as early as round 4, and he doesn’t understand what was going on with him. Joshua (20-0, 20 KOs0 did his part in defeating #3 IBF Takam in the 10th round in front of 78,000 boxing fans at the Principality Stadium in Cardiff, Wales. The fight was shown on Sky Box Office in the United Kingdom and Showtime World Championship Boxing in the States. It was a so-so performance from Joshua, who looked good and bad at times. Fortunately for Joshua, he finished strong in hurting the 36-year-old Takam in round 10, and then unloading on him until the referee Phil Edwards decided he’d had enough. The stoppage was arguably premature on Edward’s part. The way the fight ended marred the results of the fight, as it took away Joshua’s chance to stop Takam in an exciting manner. In the last 3 rounds, Joshua looked like he was fading. It’s unclear whether Joshua was stamina problems due to his career-high weight of 254 pounds or because of his broken nose, which he suffered in round 2. Joshua’s stamina problems started around the 6, so it’s likely they weren’t caused by his nose injury. “Takam was a tough dude,” said Wilder to Fighthype. “He got my respect, and he got a lot of new fans. There was too many breaks in the fight, with the eye [problems], giving him rests. On top of that, I think the stoppage was premature as well. It seemed like from the 4th round on, the referee was ready to end this fight. He was saying to Takam, ‘You done?’ I picked that up from the 4th round that the referee was trying to stop this fight for some reason. He definitely has some stamina problems. We saw that in the Klitschko fight though. That’s when he revealed himself. He definitely has a stamina issue,” said Wilder. Takam suffered a bad cut over his right eye in the 4th from a hard punch from Joshua. Takam didn’t react well to getting cut. Moments after suffering the cut, Takam spoke to the referee to try and get a timeout. Joshua took advantage of Takam’s concern for his cut eye, and he dropped him with a left hook before the end of the round. The referee did the right thing by asking Takam and his trainer in between rounds if they wanted to continue. The cut was bad, and Takam looked like he was in distress. There are some fighters that can stay calm when they’ve been cut. Takam unfortunately wasn’t one of those. He was too worried, and didn’t protect himself enough in the remainder of the round, and this enabled Joshua to knock him down. If I was him, his stamina coach needs to be fired, because there’s a lot of things Joshua is doing wrong,” said Wilder. ”I’d tell him to stay off the weights so much. He works out way too much. All those muscles can be so heavy, man. The muscles look great, but this is boxing though. Those muscles are great for lifting, but this is boxing. I’m giving away too many secrets. I’m just waiting on a date. A king doesn’t chase another king. I’m knocking on your kingdom door,” said Wilder. Joshua looked slower for this fight than he did against Wladimir Klitschko on April 29. What’s disturbing is that Joshua had talked about wanting to come in leaner for the Takam. His trainer Eddie Hearn said that Joshua would come in 10-15 pounds lighter. With all that, it was surprising that Joshua came in even heavier than the 250 lbs. he’d been against Wladimir. At this point, Joshua is not likely to stay away from weights so that he can be leaner. Joshua would likely be big and heavy even if he wasn’t lifting weights. Joshua’s father was in the ring after the fight, and he looked about the same size as him. At 6’5”, Joshua is never going to going to be leaner heavyweight. The only thing you can hope for is Joshua doesn’t keep getting bigger. Joshua looked slow and tired at 254. If Joshua adds even more weight to get into the 260s soon, then he’s probably going to start getting beaten. At his current weight, Joshua would have had problems if Deontay Wilder or Jarrell Miller was in the ring with him last Saturday night instead of the smallish 6’1”, 235 lb. Takam. The shots that Takam was landing in the second of the fight were snapping Joshua’s head sideways. Takam is not a big puncher, but he was still able to do that to Joshua. ”I declare war on Anthony Joshua. I won’t chase,” said Wilder to Fighthype. “My men will sit outside and guard. We will be waiting. I’m not going to chase. I’m not obligated to Eddie Hearn. If you want something, then you’ve got to give me something.You want Whyte. I want Joshua. Put them both in the package, and let’s make it a fight. I could knock Dillian Whyte out easily. They could literally tie one of my hands behind my back. I’ll sign the contract for the fight to happen,” said Wilder. It doesn’t look like Joshua’s promoter Eddie Hearn is willing to give Wilder a guarantee that he’ll get a fight with AJ if he beats Dillian Whyte. Hearn will only say that he’ll let Wilder fight Joshua next year if he beats Whyte, but he won’t put it down in a contract. That means Wilder might not get the Joshua fight if he beats Whyte. Without there being a guarantee, Hearn can tell Wilder to get lost if/when he beat Whyte. That means Wilder would only be getting the money Hearn gives him for facing Whyte. Hearn may not realize it but he’s being viewed with suspicion by Wilder for his reluctance to tie in the Joshua fight with the Whyte fight. Hearn will likely need to give Wilder a contractually guaranteed fight with Joshua if he does him a favor and fights Whyte. Dillian Whyte, you can’t even put him next to me. They should give Jarrell Miller a shot,” said Wilder. ”You got a lot of other guys. You’ve got Breazeale. You got Amir Mansour. He needs to fight other American guys before they come to the king. A king talks to a king. You’re a peasant. So, stay in the peasant position or the peasant order or lane. If you get out of line, we will discipline you with cruel and unusual punishment. You see Szpilka when he left the ring? What’s wrong with this dude? It ain’t going to work like that,” said Wilder. Whyte looked REALLY bad in his fight against Robert Helenius last Saturday night on the Joshua-Takam undercard. Whyte won the fight by a 12 round unanimous decision, but he struggled from the outset with the size of the big Swedish heavyweight. To make matters worse, Whyte was hurt in the 2nd round. Although Whyte denies he was hurt, he clearly was when you look at a replay of the big shot that Helenius hurt him with in the 2nd. It’s surprising though that Hearn is still insisting on Wilder fighting Whyte. You’d think that Hearn would have changed his stance on Wilder needing to take that fight after how badly Whyte performed against Helenius. Hearn was quick to jump all over WBO heavyweight champion Joseph Parker after his less than impressive performance in beating Hughie Fury last month. Despite Parker winning the fight by a lopsided 12 round decision on 2 of the judges’ scorecards, Hearn deemed him as not being a good match for Joshua because of his lackluster win. But now that one of Hearn’s fighters has looked even worse in Dillian Whyte with his win over Helenius, Hearn is still on board with him being given a world title shot against Wilder. There’s something wrong with this picture obviously. ”I have no problem fighting Dillian Whyte. That’s easy,” said Wilder. ”If the people want that, then let’s make it happen, but he [Eddie Hearn] must attach Joshua. They talking that Dillian Whyte is going to be my mandatory. If he gets in position, then I have no other choice but to fight him. I got a year still up to that fight to make the Joshua fight. So if he gets in the mandatory position, I still got a year to fight you. So, my choice is to either step over you or fight you. So, we’re not going to be chasing nobody. That’s not something we’re going to do over here in America,” said Wilder.